SINGAPORE - Singapore's exports in April shrank from a year earlier for a second straight month, although the pace of contraction slowed from the three-year low hit in March. Non-oil domestic exports slid 7.9 per cent in April from a year earlier as both electronic and non-electronic shipments fell, said trade agency International Enterprise Singapore on Tuesday (May 17), in line with the median forecast in a Reuters survey of 12 economists. In March, overseas sales sank 15.7 per cent on-year, its worst performance since February 2013, weighed by shipments to China, the United States and Europe. On a month-on-month seasonally adjusted basis, NODX increased by 4.5 per cent in April, after the previous month's 0.1 per cent growth, due to the expansion in non-electronic sales and the flat growth in electronic shipments. Such a gain, however, would not indicate a sustainable stabilisation in exports, analysts said before the report. Activity in local factories contracted for a 10th consecutive month in April, although a manufacturing index reached its highest level since June, with new orders improving, a survey showed earlier this month. On a year on year basis, NODX to all of Singapore's top 10 markets, except the European Union (EU) and Hong Kong, declined in April. The largest contributors to the contraction were Taiwan, South Korea and Indonesia. Analyst takes: Any silver lining in the latest 7.9 per cent slide in Singapore exports in April? Notably, shipments to the EU - Singapore's third top NODX market - swung to a 20.6 per cent on-year increase in April from a 31.9 per cent plunge in March. Sales to China - our top market - fell by 7.4 per cent, bit more thnan half the 14 per cent contraction suffered in March. Electronic shipments contracted by 7.4 per cent in April, less than the 9.1 per cent fall in the previous month. The decline was largely due to PCs (-21.6 per cent), parts of PCs (-23.4 per cent) and ICs (-3.4 per cent). 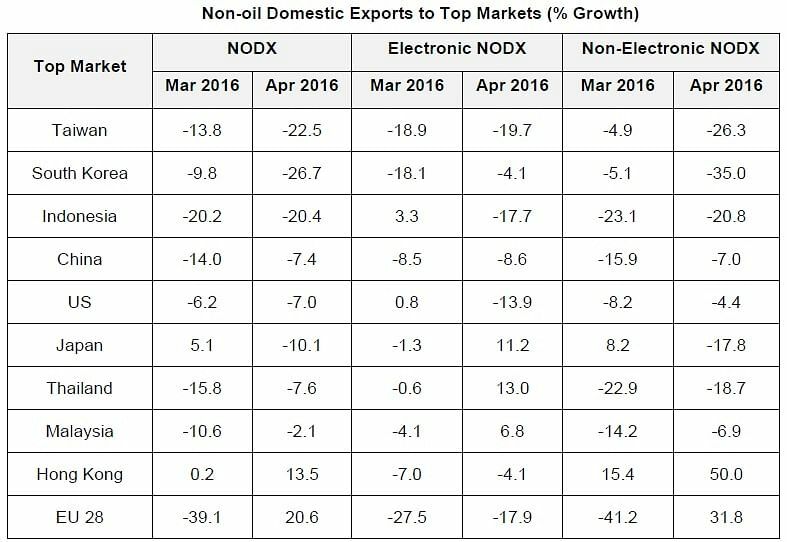 Non-electronic exports fell 8.1 per cent after the 18.0 per cent tumble in March. The decrease was led by structures of ships & boats (-94.3 per cent), petrochemicals (-16.7 per cent) and civil engineering equipment parts (-54.0 per cent).